Well it's a wet, grey 5th of November here today, so I doubt fireworks and bonfires will be on order. More like having a few friends round to share in the Guy Fawkian spirit (hey it's my blog I can coin a phrase if I want to) and watch V For Vendetta (again) on DVD. 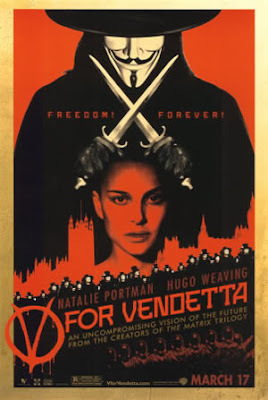 One of the best 'comic movies' so far, it fits that the two main stars each now represent one of the biggest Marvel Studios films of 2011 - Natalie Portman in Thor and Hugo Weaving as the brilliantly cast Red Skull in Captain America: The First Avenger. Great minds think alike. Alan posted about Mr. Fawkes on our site too, but left out the V for Vendetta reference. What a great movie. Hmmm RH I feel like I should know this one but Im drawing a blank... Taking a stab in the dark Swamp Thing? Am I close? a very appropriate posting for today Dan well done. this was indeed a good movie and more appreciated as it is seen again. unfortunately the whole Guy Fawkian theme (the masks) have been co-opted around here in the S.F. Bay Area by these radical leftists who have long since last sight of what real social justice is and are just on a band wagon for any anti-establishment movement. the "anti-war" rallies here are usually made up of communist groups,anarchists, 911 "truthers" and various pro-palestinian/terror apologists groups like Q.U.I.T (qeers undermining Israel terrorism) all of which today hate president Obama every bit as much as hard line conservitives. i'm gonna send you some photos later today. It was in an issue of Sandman, actually, at the end of the graphic novel collection "The Wake." I was going to find it and now I can't find my copy. And now my husband is looking at my like I'm a crazy person because every copy of every Neil Gaiman comic I own is scattered about our house. Ah well. Sandman! I haven't re-read that in a while! Thanks RH, I knew it had to be something by a British writer. As for comics scattered round the house maybe you should try telling him it's a new interior design movement and you're the early trend-setter - I'm sure it'll soon catch on! @ David - There sure seam to be a lot of political groups in the US, while we have some here I think still per head of capita we're way down the list. On the bright side I think politics proves the need for comics and their escapism - regardless of what country you read them in. one more reason why i want to move to New Zealand! first drink is on me mate. as to this link, there's plenty of crazy stuff on this page but the Guy Fawkes mask is more toward the bottom. thanks for leaving the comment on my Suicide Squad blog today Cderosby. You go to New Zealand and I'll figure out a way to visit. Those pictures were great! Thank you David! No problem David. Great blog you have there.